Sacramento, CA – A coalition of community, faith-based, civil rights and labor organizations will hold a press event TOMORROW, Thursday, May 7 at 10:30 a.m. to announce the launch of a new push to reform commercial property taxes in California. 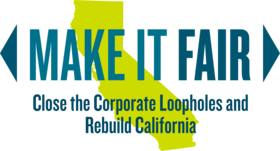 The Make It Fair movement is focused on closing loopholes by assessing commercial and industrial property at fair market value to ensure that large corporations and wealthy commercial property owners pay their fair share so we can rebuild critical services in California. At the same time, the coalition is committed to protecting homeowners, renters and farms from any changes and providing tax relief to small business owners. This effort could result in up to $9 billion in new revenue, once fully phased in, which can be used to strengthen schools, public safety, housing, infrastructure and other important community priorities. The group will be holding a press conference tomorrow where religious leaders, small business leaders, teachers and other community leaders will speak. WHEN: Thursday, May 7 at 10:30 a.m.